You can use nm-connection-editor to create a VLAN using an existing interface as the parent interface. 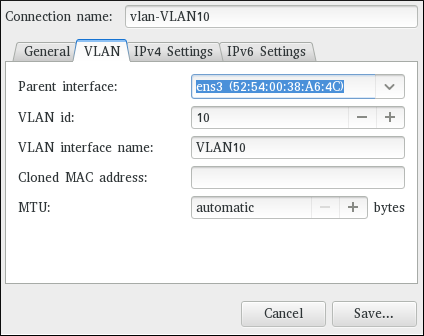 Note that VLAN devices are only created automatically if the parent interface is set to connect automatically. Click the Add button. The Choose a Connection Type window appears. Select VLAN and click Create. The Editing VLAN connection 1 window appears. To edit the VLAN-specific settings see Section 10.5.1.1, “Configuring the VLAN Tab”. Connection name — Enter a descriptive name for your network connection. This name will be used to list this connection in the VLAN section of the Network window. Automatically connect to this network when it is available — Select this box if you want NetworkManager to auto-connect to this connection when it is available. Refer to the section called “Editing an Existing Connection with control-center” for more information. Available to all users — Select this box to create a connection available to all users on the system. Changing this setting may require root privileges. Refer to Section 3.4.5, “Managing System-wide and Private Connection Profiles with a GUI” for details. Once you have finished editing your VLAN connection, click the Save button to save your customized configuration. IPv4 settings for the connection, click the IPv4 Settings tab and proceed to Section 5.4, “Configuring IPv4 Settings”. If you have already added a new VLAN connection (see Procedure 10.1, “Adding a New VLAN Connection Using nm-connection-editor” for instructions), you can edit the VLAN tab to set the parent interface and the VLAN ID. The name of the VLAN interface that will be created. For example, eth0.1 or vlan2.